Metro Morning food guide Suresh Doss visits Labora at Campo Food Hall, which is serving up Arroz Brut or "Dirty Rice" that is like a wetter version of the iconic paella from Valencia. Labora is at the Campo Food Hall at 433 King Street W.
Early in the new year, a group of us gathered to celebrate my best friend's birthday at a restaurant in one of Toronto's new gourmet food halls. There was about 15 of us, eating our way through endless plates of Spanish tapas and sizzling platters of grilled seafood; an endless river of cava flowed through the evening. As we were ready to close the night, the chef approached us. He asked us if we'd like to try a dish he'd been working on. About twenty minutes later, a large pot landed at the centre of the table. "It doesn't look like much, but trust me, it's tasty," the chef said, carefully stirring a thick brown stew as steam billowed up from the pot. 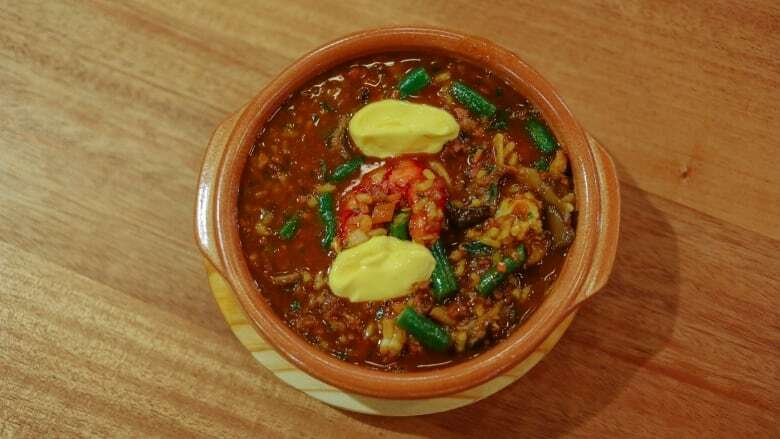 There was a wave of silence as we dug into bowls of this rich paella-like stew of rice, meat and shellfish. "Whatever that was, it was the best thing I've eaten in a long time," a friend yelled out. Quickly, a procession of hands started to reach across the table for seconds. For days I couldn't get the dish — somewhat like a paella but wetter, with whole pieces of fish and seafood — out of my head. It tasted like the ocean but had denser, earthier notes. "It's called arroz caldoso, commonly, arroz brut. It translates to dirty rice," Rob Bragagnolo, the chef, said during a follow-up visit to the Spanish market. Campo Food Hall, a Spanish-themed food market that features a tapas counter and juice bar at the front, and Spanish restaurant Labora at the back, is the latest venture from the Toronto chef. Italian-born Bragagnolo has always been fascinated with coastal Spanish food. 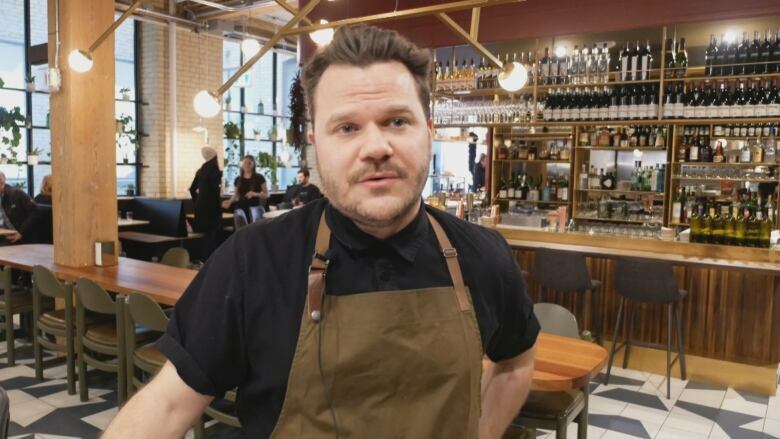 He has owned restaurants in the Balearic Island of Mallorca and with Toronto restaurants like Marben, he has tried to push forth the notion of refined Spanish cuisine. "My goal has always been to open new avenues to Spanish cuisine in Toronto. 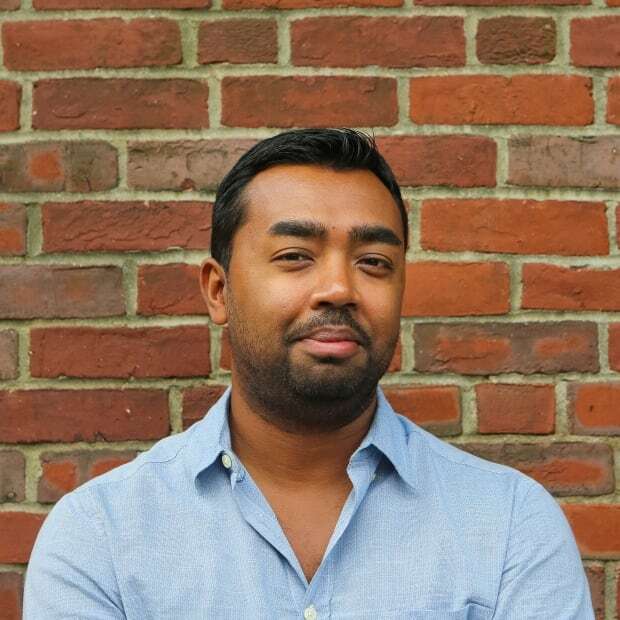 I've wanted to dig deeper and show something else that the city hasn't experienced," he said. Campo Food Hall is a convergence of ideas for the chef, who has been inspired by the food markets of Spain like La Boqueria in Barcelona and the night markets of Madrid. Bragagnolo is particularly smitten with the coastal cuisine of Mallorca. "It's the idea of mixing land and sea, mare and montagna," he said. For nearly two years, he's been working on Campo, trying to bring all of these ideas together. While chef-driven food halls have become wildly popular in North America in the last few years, and have started to open in Toronto, Campo has its own feel. It feels like a transplant of something you'd find in Palma or Barcelona. The front of the space is adorned with an assortment of pintxos — northern Spanish-style tapas — followed by a bar specializing in Spanish wine and cocktails. At the back, it feels slightly more like a European beer hall, with an open kitchen and large family-style dining tables. "The back is the spine of Campo. Labora is where we play," Bragagnolo says of the restaurant within a restaurant. At Labora, Bragagnolo ventures beyond finger foods and delves deeper into the coastal fare of Mallorca with rice dishes. The most notable is the arroz brut, a laborious dish that relies on a super stock to create a meal that is like a wetter version of the iconic paella from Valencia. Making the base — the flavourful stock — is a long process. "The stock is made with chicken, pork, vegetables, shellfish and iberico ham," Bragagnolo says. 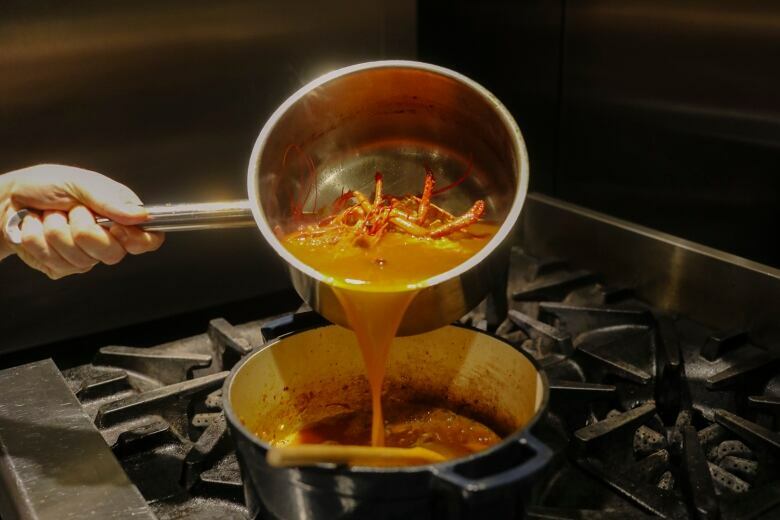 While the stock simmers, Bragagnolo preps a sofrito, a sauce with a variety of chopped vegetables, soppressata, wild mushrooms and whole sections of lobster. 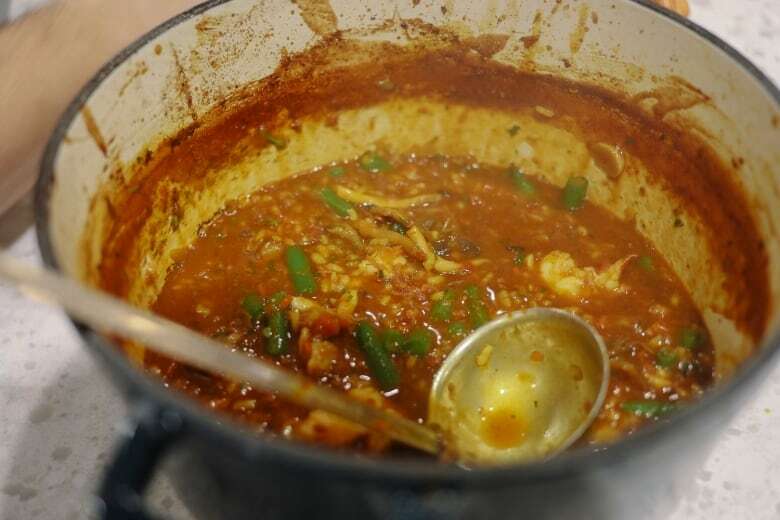 The stock is then slowly ladled into the sofrito as it cooks to create a soup base for the rice, which is added about halfway through the process. 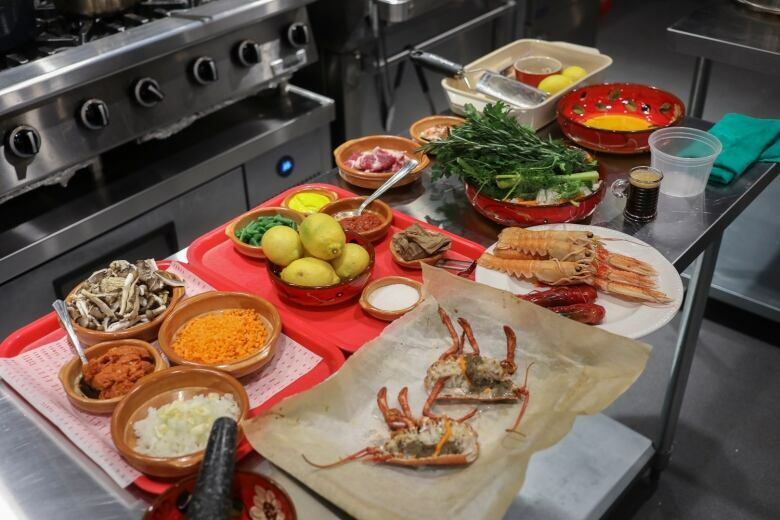 During the final moments, Bragagnolo tosses in the seafood, a medley of red prawns, sea bream and squid along with some chopped chorizo. While most of the food we eat at restaurants is "Instragrammable" these days, this dish is a pleasant visual exception. The edges of the pot are charred and the stew is a rich brown pool with highlights of vegetables and seafood. It is called dirty rice, after all. But what it may lack in aesthetic, it more than makes up for in taste. Each spoonful is a splash of ocean flavour complemented by earthy and meaty notes. Bragagnolo has managed to open a door to traditional Mallorcan cooking with the arroz brut. I recommend that the best way to enjoy it is with a group of friends.